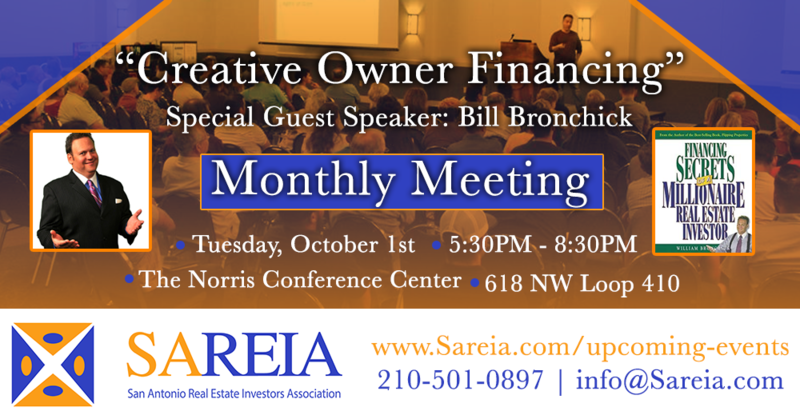 San Antonio Real Estate Investors Association - Monthly Meeting - "Creative Owner Financing with Special Guest Bill Bronchick"
Monthly Meeting - "Creative Owner Financing with Special Guest Bill Bronchick"
Please join us and Bill Bronchick as he discuss how to create a successful owner financing portfolio. Mr. William Bronchick has been practicing law and investing in real estate since the early 90’s, having been involved in thousands of real estate transactions. He has trained countless people all over the Country to become financially successful, speaking to audiences of as many as 16,000 at mega-events, sharing the stage with names like Rudy Guliani, Steve Forbes, and Colin Powell.